In my post last week, I used a recent study on the urban evolution of white clover and its coverage in the popular press to start thinking about how traits described as “weedy” relate to human-plant entanglement and co-evolution. I looked at the extended naturalcultural history of white clover, and its rapid adaptation to an urbanizing world. So what does the term “weed” have to offer in this context? Well, like white clover, the term has been with us for quite some time, and has gone through a series of evolutions in its meaning and usage, from the technical to the poetic. Like clover it continues to evolve under the pressures of the current moment, and I find that the two illuminate one another in intriguing ways. In its most common usage, the term “weed” has been part of the English language for at least a millennium. The OED cites it as appearing in Boethius’ The Consolation of Philosophy as early as 888, where it took the Old English form weod. It appears regularly in English literature, philosophy and scientific texts throughout the colonial period and industrial revolution, from Shakespeare’s Venus and Adonis (1593) to John Worlidge’s Systema agriculturæ (1669) to Emily Dickinson’s “All overgrown by cunning moss,” (1860, published 1924). 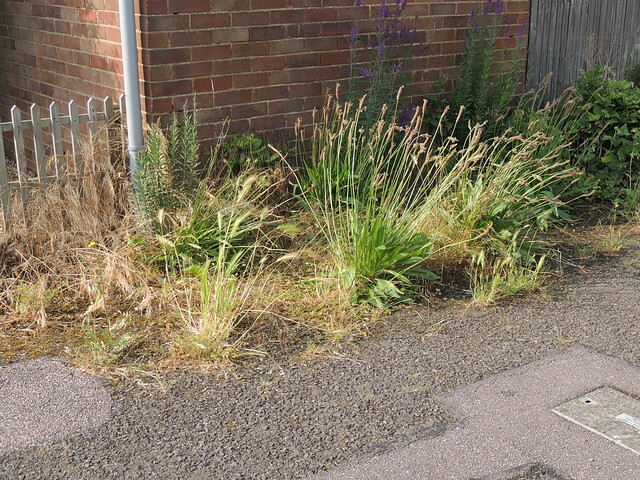 In these examples it’s used pejoratively to refer to spontaneously growing herbaceous plants that are either undesirable (competing with cultivated plants or more desirable wild plants) or simply unintentional and thus less valuable. Ralph Waldo Emerson’s well known quotation “What is a weed? A plant whose virtues have not yet been discovered…” (Complete Works, 1904) reveals that at least by the late 19th century, by which time white clover was well-established in the United States, the relative and subjective nature of the term had been acknowledged. The primary OED definition from 1965 reveals why the term is worth contesting: “Weed: A herbaceous plant not valued for use or beauty, growing wild and rank, and regarded as cumbering the ground or hindering the growth of superior vegetation.” The subjective nature of beauty, and the culturally specificity of what is considered “superior” when it comes to utility and desirability provide clear avenues for productive critique. Since the 1960s, with the expansion of industrial farming and the rise of environmentalism around Rachel Carson’s Silent Spring, uses of the term “weed” have fractured. Following Carson’s reframing of insecticides and herbicides as “biocides”, a suite of alternative terms for weed, from “spontaneous urban vegetation” to “volunteer” to “invasive species” have proliferated. If others retreated from the term, industrial agriculture moved to embrace it wholeheartedly. The increasingly professionalized field of “weed science” has advanced an un-ironic, utilitarian use of the term that is based on economic impacts of “noxious” and “pest” species (see the Weed Science Society of America website and journal series). Since the 1980s the related concept of “invasive species” has been on the rise, complicating the term’s meaning. Originally defined by Charles Elton in 1958, it has bled out of the ecological and agricultural sciences and into the popular imagination and government legislation. Both “weed” and “invasive species” continue to be contested terms in the sciences and beyond, (see Colautti, R. I. and MacIsaac, H. J., 2004), but are generally used to describe species that are, or are likely to, “cause economic or environmental harm to human health” (NISIC, USDA, 1999). In popular discourse they words are often conflated, used interchangeably or in tandem with one another, while the ill effects of the pesticides and herbicides used to control the organisms they deride are either not discussed or treated as a tolerable tradeoff. In the New York Times column I mentioned last week, these layers of meaning seem set aside, or at least lurk well below the surface. After appearing in the headline, the term “weed” emerges again when the author writes that clover is “considered a nuisance or a weed when it pops up in luscious suburban lawns, long the bane of gardeners and homeowners sodding, sprinkling and nurturing the greenest of grasses.” Is a weed somehow different than a nuisance? Is it more than annoying, as suggested in the headline? When and why? The current OED definition doesn’t shed much light: “A wild plant growing where it is not wanted and in competition with cultivated plants.” Not wanted by whom? And what counts as cultivated? While it might be a common perception that clover is an unwanted interloper in lawns, as noted in my last post, clover has in fact been actively cultivated by humans and purposefully introduced into turf mixes for generations. This contradiction reflects the circular logic of weediness, in which weeds only exist in relationship to human preferences and needs. The plants that thrive alongside us are protean in the roles and meanings they play for us, as are the terms that describe them. The reflexive nature of co-evolution between clover and humans points to a relatively recent development in the way the term “weed” is used. By the closing decade of the 20th Century, popular writers like Michael Pollan and David Quammen were responding to the biological characteristics of weedy species (they “reproduce quickly, disperse widely, tolerate a broad range of habitats, take hold in strange locations, succeed in disturbing ecosystems and resist eradication once they’re established.” (Quammen, 1998), by pointing out that all these traits also belong to humans. This leads to the conclusion that humans are actually the most successful weedy species on the planet, and that other weedy species have us to thank for their explosive proliferation. It should be pointed out that realizations like this one arose alongside, and perhaps in response to, foundational work in feminist and ecofeminist theory by the likes of Val Plumwood, Stacy Alaimo, Donna Haraway and countless others, who laid the groundwork for dismantling systems of thought that put humans outside of and above the rest of nature. And, while the conclusion that humans are a weedy species has an appealing logic, thinking with Haraway and her ilk reminds me that any universalizing trope, however attractive, is worth interrogating. So let’s not accept the expansion of weediness to include humans as the definitive step in the term’s evolution. Instead, let’s ask: what baseline environmental situations promote a “weedy” response in organisms, human or otherwise? Returning to the discipline of ecology might be helpful here. Recent studies have shown that whole species are not necessarily intrinsically weedy, despite Pollan’s assertion that “absolute weediness” exists. Rather individual organisms or populations act weedily in certain contexts. So what then is the context that is relevant here? One obvious context we might attend to is that of capitalist growth and resource extraction accompanied by massive ecosystem disturbance, which is hitting different regions at varied intensities. As Anna Tsing reminds us, contemporary ecosystems are patchy, as are the causes and effects of the Sixth Extinction. In this context, the shifting fates of certain populations, whether they are flourishing, declining, migrating or adapting, becomes a signpost to be read, if we can learn to decipher it. The tools of urban ecology, if applied in this spirit, can help us see that white clover and many of its human co-habitants are the passengers, not the drivers, of our ecological crises (MacDougall and Turkington, 2005). Life responds, adapting or disappearing, while social system based on endless economic growth benefits a small proportion of the human population at the expense of multispecies livability, a state of affairs that theorists like Haraway and Jason Moore have sought to rename the Capitalocene. Following Tsing further, whatever “cene” it is we are inhabiting, we would do well to acknowledge weedy plants as our companion species, and strive to learn from them, as plant biologist Robin Wall Kimmerer sagely recommends. In this light, by studying white clover we are actually studying ourselves, so entangled are the members of this species with human-driven land use patterns. So while the authors of the Royal Society paper eschew the term weed, the discoveries they relate are fittingly described by it, if one allows the term to live and breath in many registers at once. Labeled a weed, a single clover plant becomes simultaneously an annoyance to be subdued by human ingenuity and a resilient truth-teller leading us to the secrets of urban evolution. Today’s weeds are both muse and portent, Janus-faced beings proffering tales of resistance and hope while in the same breath, whispering “I wouldn’t be here without you.” In its multivalence, the term is one of many fraught words joining the growing lexicon swirling around the so-called Anthropocene. Like Anthropocene itself, it’s a term I use with ambivalence, one I find salient precisely due to the residue it retains and the cognitive dissonance it affords. Altvater, Elmar, Eileen C. Crist, Donna J. Haraway, Daniel Hartley, Christian Parenti, and Justin McBrien. Anthropocene or Capitalocene? : Nature, History, and the Crisis of Capitalism. Edited by Jason W. Moore. 1 edition. Oakland, CA: PM Press, 2016. Carrington, Damian. “Earth’s Sixth Mass Extinction Event under Way, Scientists Warn.” The Guardian, July 10, 2017, sec. Environment. https://www.theguardian.com/environment/2017/jul/10/earths-sixth-mass-extinction-event-already-underway-scientists-warn. Carson, Rachel, Linda Lear, and Edward O. Wilson. Silent Spring. Anniversary edition. Boston: Houghton Mifflin Company, 2002. Emerson, Ralph Waldo. The Complete Works of Ralph Waldo Emerson: With a Biographical Introduction and Notes. Printed at the Riverside Press, 1904. Harlan, Jack R., and J. M. J. deWet. “Some Thoughts about Weeds.” Economic Botany 19, no. 1 (1965): 16–24. Haraway, Donna. Simians, Cyborgs, and Women: The Reinvention of Nature. 1 edition. New York: Routledge, 1990. —. “Situated Knowledges: The Science Question in Feminism and the Privilege of Partial Perspective.” Feminist Studies 14, no. 3 (1988): 575–99. https://doi.org/10.2307/3178066. Johnson, Marc T. J., Cindy M. Prashad, Mélanie Lavoignat, and Hargurdeep S. Saini. “Contrasting the Effects of Natural Selection, Genetic Drift and Gene Flow on Urban Evolution in White Clover (Trifolium Repens).” Proceedings of the Royal Academy. Biological Sciences 285, no. 1883 (July 18, 2018). https://doi.org/10.1098/rspb.2018.1019. Kimmerer, Robin Wall. Braiding Sweetgrass: Indigenous Wisdom, Scientific Knowledge and the Teachings of Plants. Milkweed Editions, 2015. MacDougall, Andrew S., and Roy Turkington. “Are Invasive Species the Drivers or Passengers of Change in Degraded Ecosystems?” Ecology 86, no. 1 (January 1, 2005): 42–55. https://doi.org/10.1890/04-0669. Malone, Nicholas, and Kathryn Ovenden. “Natureculture.” In The International Encyclopedia of Primatology, 1–2. American Cancer Society, 2016. https://doi.org/10.1002/9781119179313.wbprim0135. Pollan, Michael. “Weeds Are Us.” The New York Times, November 5, 1989, sec. Magazine. https://michaelpollan.com/articles-archive/weeds-are-us/. Quammen, David. “Planet of Weeds.” Harper’s Magazine, October 1998. http://www.davidquammen.com/sampler/18-planetofweeds. Tsing, Anna. “Earth Stalked by Man.” The Cambridge Journal of Anthropology 34, no. 1 (March 1, 2016): 2–16. https://doi.org/10.3167/ca.2016.340102. —. “A History of Weediness.” In Friction: An Ethnography of Global Connection. Princeton University Press, 2011. “Weed | Definition of Weed in English by Oxford Dictionaries.” Oxford Dictionaries | English. Accessed August 31, 2018. https://en.oxforddictionaries.com/definition/weed. “Weed Science Society of America.” Accessed September 1, 2018. http://wssa.net/. Weintraub, Karen. “White Clover Can Be an Annoying Weed. It May Also Hold Secrets to Urban Evolution.” The New York Times, August 7, 2018, sec. Science. https://www.nytimes.com/2018/07/20/science/white-clover-evolution.html. This entry was posted in Reflections and tagged co-evolution, dualism, ecology, invasive species, weeds. Bookmark the permalink.